The Frenchman added his first win of the season after a powerful attack in the final climb. Fernando Gaviria maintains the leadership. 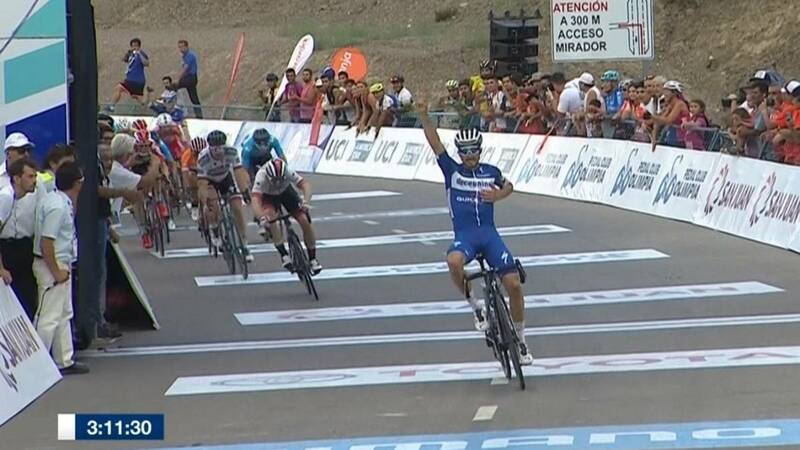 Frenchman Julian Alaphilippe (26 years old) achieved victory in the second stage of the Vuelta a San Juan in a show of strength after a tough preseason for Spanish lands. The day was marked by intense heat, with temperatures exceeding 37 degrees. This caused a delay in the exit of half an hour after applying the emergency protocol. The route was reduced from 160 to 130 kilometers, climbing three times in Alto de Punta Negra (1.6 kilometers to 8.6% and with a peak of 13%) instead of the four planned.
. be formed. Finally, three were its members: André Gohr (Brazil), Miguel Álvarez (Mexico) and Hamish Schreurs (Israel Cycling) being this New Zealander the last one to be neutralized, with nine kilometers to go. At that time, Movistar and Deceuninck took control of the peloton, and with the mind in the last climb, although it was not the goal, it seemed decisive. Then when Alaphilippe jumped, only Quintana and Benoot could follow his wheel. It seemed that the three were going to play the victory, but both Colombian and Belgian were not understood in the relays ... something that the French did not miss. The leadership continues to be for Fernado Gaviria, who managed to reach the small group and also took three points in a flying goal. Today, totally flat 12-kilometer time trial in Pocito.